In this article, we take a look at the best side by side refrigerators available in India as of April 2019. Top refrigerators from brands like LG, Samsung, Haier, Hitachi, and Bosch have been listed in this article. These side by side refrigerators come with a capacity of 500 liters to around 700 liters. So if you have a family of 5 to 8 members, this capacity is suitable for you. The refrigerators on this list are priced from 50000 to 70000 Rs. So, if you are looking for a side by side refrigerator under 50000, 60000 or 70000 Rs, you will find plenty of great options here. If you have a budget of under 40000 then see our article on best refrigerators under 30k to 35k. Most side by side refrigerators have the freezer on the left side and the fridge on the right. The look very premium because most of the brand provides a steel finish on the front. You will also find a display and control panel on the front using which you can change the temperature and other functions according to your requirements. These refrigerators come loaded with all the latest features you would expect. Let's take a look at the best side by side refrigerators in India. A brief review for each refrigerator with their pros cons and specifications is provided below. Need a refrigerator with a ton of space and from a brand like Samsung? This is a great option for you. This side by side refrigerator from Samsung comes with a large capacity of 674 Liters. If you have a family of 6-7 members, then it will be perfect for you. The refrigerator comes with the latest and great technology from Samsung and provides excellent performance. The fridge is loaded with Smart sensors that monitor conditions and adjust the settings based on a variety of factors. This way, if you or your family members frequently open the fridge door on a hot day, the Smart Sensor System speeds up the compressor to keep the interior cool and your food fresh. At night, when your home is much cooler, and you don’t open the fridge often, the compressor slows down. This helps in power saving as well. The fridge has slide out drawers. The Easy Slide shelf is built on rolling hinges and can easily be pulled out. This lets you efficiently organize and easily access your food items. A digital display and control panel is provided on the front of the fridge using which you can change temperature and other things according to your requirements. Other features include Power Cool, Power Freeze, Twin Cooling, Multi Flow etc. Overall, it is a fully loaded side by side refrigerator from Samsung and our favorite under 70000 in India. The Samsung 674 L Side by Side Refrigerator is priced around Rs. 74990. This is a very spacious side by side refrigerator from Bosch with a capacity of over 650 liters. The capacity is great for a large family of 5-7 members. You can store a ton of food in this amount of space. The refrigerator looks really nice because of the steel finish on the front and a large control panel in black. The refrigerator comes loaded with plenty of features that you would expect in a side by side refrigerator. The fridge has VitaFresh Plus technology which is a finely tuned system, the flavors, nutrients, and moisture of food items in this fridge are maintained double times longer than conventional refrigerators. The VitaFresh Plus tech maintains the original flavor, texture, and appearance of fruits and vegetables for a long time. Bosch has provided a BigBox that is ideal for storing large food items like pizzas, tall containers of food, or even an entire lamb leg. Bosch has implemented a MultiAirflow System which improves the circulation of air in this refrigerator, regulates its temperature, and eliminates possibilities of condensation. The MultiAirflow system ensures an even temperature inside the fridge so your food stays fresh and edible regardless of where in the fridge they are stored. Bosch is a global brand and makes excellent quality products and it is visible in this refrigerator as well. Go for it if you are looking for a side by side refrigerator under 70000 Rs. The Bosch 661 L Frost Free Side by Side Refrigerator is priced around Rs. 72999. This Side by Side refrigerator from Samsung has a capacity of 545 Litres. It comes in metal graphite colour with a Samsung branded on the top right corner. It has a digital display on the left door that displays the temperature of the fridge and freezer and has 4 controls buttons to change the temperature and modes. This refrigerator uses digital inverter compressor technology that regulates the cooling based on the requirement and saves a lot of energy. These compressors also have less noise which extends their life cycle. It comes with all round cooling technology that cools each and every shelve with equivalent cooling and retains freshness in all the items. It also has the feature to convert the freezer into the fridge giving you additional capacity. It has a separate lockable compartment to keep the dairy products fresh for a long time that retains cooling even if the refrigerator is opened frequently. The Samsung 545 L 5 Star Side by Side Refrigerator is priced around Rs. 60999. This is a premium looking side by side refrigerator from Samsung with a massive capacity of over 600 liters. The capacity is suitable for a family of 5-6 members. It is 4 star rated which means you will save a good amount of money in electricity bills and save the environment as well. It is a fully loaded fridge with plenty of features. There are Nine internal and external sensors monitor conditions and adjust the refrigerator settings automatically, keeping your food fresh in any condition. The refrigerator has Digital Inverter Technology which automatically adjusts the compressor speed in response to the cooling demands across seven levels. This reduces noise levels and improves the life of the refrigerator as well. An Iceblue LED Display and Control is provided to control the temperature and other functions of the fridge. The fridge also has a door alarm which will alert you if you forget to close it. This side by side refrigerator from Samsung comes with Power Cool and Power Freeze options which are great if you need to cool or freeze something quickly. Beautiful design and plenty of features make it one of the best side by side refrigerators in India under Rs. 70000. 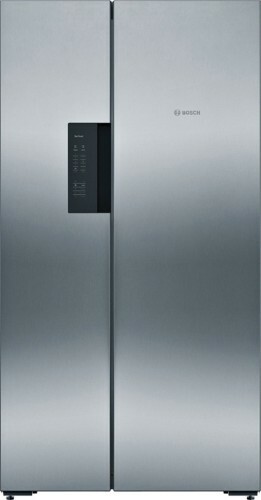 The Samsung 604 L Side by Side Refrigerator is priced around Rs. 69999. This is a side by side refrigerator from LG with a capacity of 687 Litres. It is suitable for a family of 6-7 members and has a beautiful and stylish design. It is a feature rich refrigerator and comes with an inverter compressor that adjusts the cooling by switching on and off the compressor as required, hence resulting in less consumption of electricity. The inverter compressor has less noise which increases its lifespan. It has a Smart ThiQ so that you can control the temperature of the fridge or diagnose any error through the smartphone application. On the front left door, there is a digital panel that displays the mode and the temperature of the fridge and freezer. This refrigerator has Multi Air Flow Technology that uses multiple vents located inside the fridge for proper air flow all over the refrigerator to keep the food fresh every time. It has an inbuilt stabilizer to handle any kind of voltage fluctuation and comes with a 10 years warranty on the Compressor. It has a smart diagnostic system which itself detects and reports the error which can be shared with the LG customer care for faster resolution. You can also check the 675 L variant of the LG Side by Side Refrigerator. The LG 687 L Side by Side Refrigerator is priced around Rs. 79990. It is a side by side door refrigerator from Panasonic with a huge capacity of 582 Litres. This refrigerator can serve a family of 5-6 people and looks very beautiful with a stainless steel finish and would certainly suit your kitchen well. In terms of design, this Panasonic refrigerator has a dual vegetable box that stores and keeps the vegetables and food fresh. It comes with a new cooling system that offers optimized and power packed performance. The shelf on the sides of the door can be covered to protect anything falling onto the items. On the left door, there is an LCD display that displays the temperature of fridge and freezer and supports operation to switch between different modes. It comes with Quick Freeze Mode and Quick Cool Mode that is responsible to drop the temperature from 32 degrees to -18 degree and 5 degrees for the freezer and fridge respectively in about 3 hours. This will help you quickly freeze or cool stuff when you have someone coming. This refrigerator has an inbuilt stabilizer and will protect the refrigerator from any damage of voltage fluctuations. It also has a warranty of 9 years of the compressor and 1 year on the complete product. The Panasonic 582 L Side by Side Refrigerator is priced around Rs. 51999. It is one of the first side by side refrigerator in this price range with a very stunning design. It has a capacity of 565 Litres that makes it a perfect option if you have a big house and a big family of 5-6 members. It has so many shelves and side trays to store a lot of food. Despite being a high capacity refrigerator, it consumes electricity as low as 1 unit per day because of its 4 Star power efficiency rating. It comes with a feature of Holiday Function, that can be used when you are going on a holiday and this refrigerator fixes the temperature to 17 degrees to keep the food fresh when you come back. Also, this refrigerator adjusts its temperature based on the requirement and the temperature of outside conditions. Adding to its superior design is a beautiful LED display that shows the temperature of the fridge and freezer and option to switch between different modes. It has a rating of 4.4 on Flipkart from over 600 customers. This refrigerator does not have an inbuilt stabilizer so if there is any sort of voltage fluctuation in your home or office, we would recommend buying a separate stabilizer to keep the fridge safe from any damage. It also comes with 9 years warranty on compressor while it has a high lifespan of more than 15 years. So there are few options for such a high storage but this refrigerator is absolutely stunning and we think it is the best side by side refrigeratory under 50000 in India with a capacity of around 600L. If you are looking for a Hitachi Side by Side refrigerator with an inverter compressor technology, you can check it here. The Haier 565 L 4 Star Side by Side Refrigerator is priced around Rs. 54990. So that was all we had on the best side by side refrigerators in India. We hope the article was helpful and you were able to find a new side by side refrigerator according to your requirements and budget. Also, take a look at our list of best refrigerators in India from Rs. 10000 to 60000.